poem at the beginning of his essay Circles. Courtesy Ronald Feldman Fine Arts, New York. The first image in the exhibition is a circle, a great polar projection of the earth's sphere with the pole in the center of Europe. Through the circles of our eyes, as Emerson might say, this center is connected to our center, and thus we enter into a realm of the world and of ourselves at the same time. Inside the gallery we are surrounded by large maps on the walls, the floor, and a pedestal in the center of the room which have the strange effect of putting us at the same scale, in the same predicament, as the land. We have been drawn into the middle of an argument, a conversation, about the future of the peninsula, which is carried along by texts on the walls that ask questions and answer them in a kind of dense and charming academic prose, and by the recorded voices of Newton and Helen Harrison in the beginnings of an actual conversation. But mostly we are engaged with the land itself, as we often forget to be otherwise. However human beings are placed in nature--as farmers, businessmen, scientists, philosophers, artists, etc.--the consequence is invariably intrusive, out of balance, a matter of thought. That thought has been, not just in western civilization but noticeably there, predominantly technical or practical, about how to grow things, use resources, determine physical laws, explain our existence, justify our existence, emphasizing our differences from and superiority to other organisms, which in many cases are other human beings. Intellect is what distinguishes us and enables us to exploit the world's wealth and then to address the problems created by our exploitation. Invent formulas, machines, strategies, filters, antidotes, anecdotes, inoculations, barriers, drains, habits, and big holes in the ground to make it possible to keep consuming the earth. Still, it is pretty widely understood that consumption is a disease that appealed to the19th-century romantic imagination and still appeals to the industrial and post-industrial imaginations of the 21st century. Of course, one could as easily say that these human proclivities, involving a variety of contradictions, are as natural as anything else--only human rather than snake or tree--and that they will lead naturally to an appropriate end. From the edge of that system of thought, though not always from within it, the links in the chain of being and non-being are apparent, from the clearing of land to the adoption of monocultures to the domestication of animals to the redirection of rivers to the proliferation of pollutants to the diminution of biological diversity to the desertification of formerly complex ecosystems. It is also apparent that the mental system needs renewal, not simply adjustments, if it is to continue to apply to a functioning reality. There are lots of discreet solutions designed to keep things going, and sometimes even linked--environmental regulations, nature reserves, garbage removal and toxic waste cleanup, disarmament, genetic engineering--though all of them introduce additional problems, with entropy lying in wait. Perhaps that is simply fate. But fate requires imagination, the projection of the complexity of all we know into an entity, and is therefore alterable in a thing that can be created, a work of art. Nature as a whole is a changing whole; its wholeness includes or depends on its changingness. In human terms, this can be apprehended through the senses and expressed in music and language, painting and sculpture, buildings, philosophical propositions, scientific formulas and computer models. It is impossible to say why anything in art or thought, any color, shape, shadow, light, or sound, attains an intensity of being, of life, except that it is perceived as part of a changing whole. Universal energy coalesces in Michelangelo's idealized bodies, particularly human ones, in Monet's light, Yves Klein's meteoric traces, and the Harrisons' mapping of the earth. The specifics are necessarily historical, recognizing that chronology represents the changing whole. In other words, it would be impossible now to completely avoid understanding the earth as an integrated organism, whatever resistance there might be to that notion. Because they will not separate aesthetics and ecology, the Harrisons address these issues in a rather unique way. The work of art is a given, as is its effect on fate. In 1969-70 they made a decision "to do no work that did not in some way look at ecosystem well-being" (I think they used the word "survival" in another statement of purpose). The world spreads out before them no less forcefully and intricately than it did for Vuillard in the apartments, theaters, and parks of Paris, or for De Kooning in his controlled detonations of psychic and aesthetic abstraction. They are interested in what is there, in its plenitude and completeness, only their subject is ecosystem rather than, for instance, religious narrative or portraiture, though, in fact, any specific subject, such as Michelangelo's Last Judgment or John Singleton Copley's Boy with a Squirrel, could be described as ecosystem, in which the whole is greater than the sum of its parts. Maps are among the most comprehensive and useful forms of human expression. As they have evolved over the centuries, they have become capable of carrying a tremendous amount of information--geophysical, demographical, political, etc. They represent, in a way, technical expertise and sophistication, what we know about the world in statistical and physical terms, which ultimately is limited in those terms. And yet there is a powerful atavistic quality about maps as well, not only because they preceded written language in many places but also because they evoke our larger apprehension of the world in all its complexity. The Harrisons invoke both aspects of mapping, merging one into the other. The map becomes an aesthetic medium, like a painting, in which rivers, mountains, forests, plains, and areas of human habitation converge in abstract patterns that are nonetheless very familiar to us. The detail of line and brushstroke, of color and hue, is no more or less representative than that of any painting, but, as in the landscapes of Vuillard, again, it is representative of the multitudes of nature. This is human beings looking at nature, seeing nature, being in nature, as one must look at, see, be in any work of art. There is no other context, though one can choose to ignore this one. In one series, Newton and Helen Harrison are seen standing on huge floor maps looking out over the peninsula of Europe from Scandinavia and Turkey toward the great plains of Asia. In the gallery the viewer can walk on floor maps of Europe and Holland (the latter in tiles) and stand in certain places to hear the Harrisons talking about the progression of ideas they have proposed. Within some maps are photographs of particular details, of meadows, forests, or streams, further directing inward the level of sight and discourse by means of fragments experienced through human eyes. The whole thing can be blank or one can be drawn into it, to discover things almost against one's will. It is then possible to begin moderating and offering changes. Two projects, commissioned by groups in England and Holland, deal with particular areas in those countries. 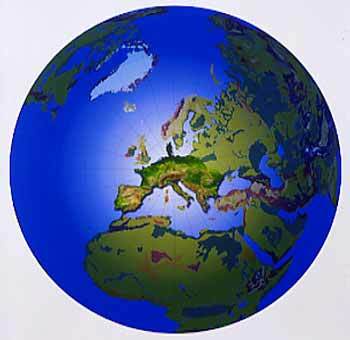 Peninsula Europe, the third and most comprehensive work, was begun in 2000 under the auspices of Expo 2000 and the Schweisfurth-Stiftung, and then funded by the European Union, the Environmental Protection Foundation of the German government, and three museums. 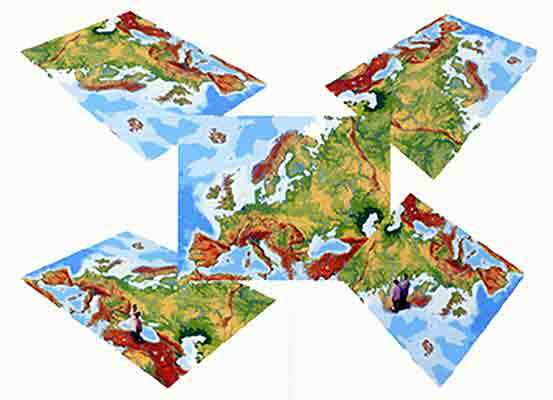 After erasing national borders on maps and looking for the continuity of natural formations, it became apparent to the artists that much of Europe is a peninsula surrounded on three, and almost four sides, by the Baltic and North seas to the north, the Atlantic Ocean to the west, the Mediterranean and Black seas to the south, and to east the narrow troughs of the Vistula running north to the Baltic and the Dnester running south to the Black, two rivers whose sources come within thirty miles of connecting with each other. Within these boundaries are two major salient features: a serpentine pattern of mountains along the southern half and an extraordinary network of rivers throughout, which carries water from the high grounds through the plains and eventually to the surrounding ocean and seas. The two configurations are interlocking, and essential to one another. They form the body of Europe and its life systems. Throughout this body, the rivers draw water from the high grounds to feed the land and its living organisms in a mosaic of drain basins or watersheds. Each of these watersheds is distinct from the others, of course, as distinct in shape and size as the densities and types of life they support, including human life. There are seventeen or twenty larger watersheds, the largest being the Danube River basin, and scores of smaller ones, mostly along the coastlines. In the diptych So Who's Attending to the Connectivity of the Whole?, it is this pattern that emerges from the two basic systems, as an image and as a reality. 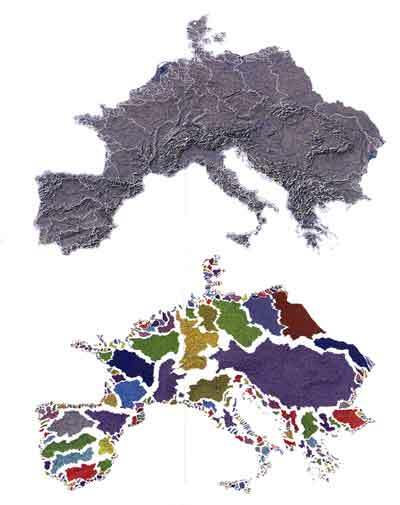 Six watersheds--around the Garonne, the Oder, the Sava/Drava/Mura, the Rhine, the Mulde, and Vienna--were considered specifically by the Harrisons in the 1980s and '90s at the invitation of various organizations. Exploring each area, with experts and on the ground, led to the discovery of particular conditions and possibilities: the flooding of the Garonne and how it might be redirected, the serendipitous collecting of rainwater in limestone plateaus outside Vienna, the beginning of a natural process for cleaning up the Mulde River. These individual projects set the stage for thinking about the entire peninsula, for "attending to the connectivity of the whole" and realizing that the high grounds and the river systems are together the source of the peninsula's ecological health and diversity. It is in the meadows and forests above 300 meters, where much of the peninsula's water originates, that ecological restoration and maintenance must begin the process that would then continue with increasing ingenuity in the more populated lands below. Everything proceeds from the "icon" of the mountains and coalesces in a picture of great synergistic intricacy. The picturing is also a process that is moved along by language, by "conversational drift." Endemic problems such as toxic waste and other forms of pollution, clear-cutting, monoculture, acid rain, overdevelopment, flooding, etc., are certainly recognized as such and addressed in a variety of ways, but they are seldom if ever pictured. The idea is not to stop at that place but to continue the conversation beyond the problem itself to a larger picture, to go from one picture to another, from one work of art to another continuously weaving together the health of the system. Imaging is saved for that which is worthy of its being imagined. The exhibition was held at Ronald Feldman Fine Arts, 31 Mercer Street, New York, NY 10013.